Salli Terri - "Folk Songs of the New World"
Check out those soloists: Harve Presnell, later from the movie "The Unsinkable Molly Brown" and more seriously in the Cohen Bros' "Fargo"; and Salli Terri (who appears in "Duets With the Spanish Guitar"). 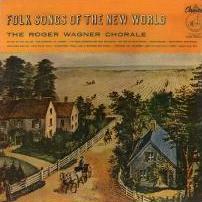 She co-arranged these familiar songs with Mr. Wagner. And then there's the simply ab-fab Marilynn [sic.] Horne. We hear Ms. Horne only in the plaintive ballad He's Gone Away, but it is only one of the many vocal highlights in this album. Other songs include: Black is the Color, I Wonder as I Wander, On Top of Old Smokey, Shenandoah, Streets of Laredo, Sometimes I Feel Like a Motherless Child, and - no kidding - I've Been Working on the Railroad. That program probably couldn't be performed today with a straight face. Like the other recordings in the Capitol FDS series with the Roger Wagner Chorale (especially "Folk Songs of the Frontier", FDS P8332) this is a pretty fine demo record. Unlike your garden variety demo, this one has an unprocessed presentation so uncharacteristic of the medium that you will wonder why recording producers generally eschew the practice. The answer is simple and yet elusive: dynamic range. The arrangements are something of a hoot - not the slightest bit authentic, no matter what your definition of that might be. The singing style is what you might call "disciplined," which was very much in vogue in the fifties and sixties for youthful choral groups. Imagine determination mixed with enthusiasm; that's Roger Wagner.